Ideally suited to route delivery and other mobile applications. 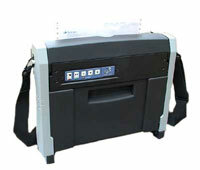 Battery-operated tractor-feed printer with shoulder strap – portable printing where you need it, in your vehicle, on foot or at a customer site. Internal paper storage protects media, and provides ready to go printing. For in-vehicle use, this compact printer can be mounted in a variety of locations, making it suitable for use in any truck or van, where continuous 1- to 4-part form printing is required. For in-vehicle use, this compact printer can also be mounted in a variety of locations. Its compact size makes it suitable for use in law enforcement and other mobile applications where single sheet or individual multi-part forms are used. The 2 Million character cassette utilizes a reinker to achieve a compact size and provides consistent print quality throughout its life. A precision ribbon shield makes loading easy, quick and convenient. To make paper loading fast and simple, the print mechanisms used in the MIP3X tractor feed printers is moved out of the way during paper loading, providing direct access to the tractors. Paper loading in the MIP3F friction feed unit is made simple by use of a paper guide where the form is easily slid into its print position. 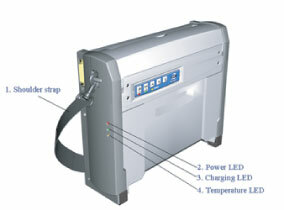 Ruggedized brackets and vehicle power cords are available, as well as 110/220v to 12v power converters for in office/warehouse use, and battery charging for the portable printer. Take It Wherever You Need It. Internal Paper Storage - provides ready to go printing. Features: Open mechanism for easy paper loading on tractor units; insertion slot for friction drive unit. Voltage: 12/24 VDC Nominal, 10.5 - 30 VDC;110/220 VAC converter available.